If you are accosted by a screaming po liceman continue walking and do not respond. If you stop as I did, because you are afraid and behave without thinking as I did, ask if you are being detained. If you are not being detained (another word for arrested) continue walking and say nothing. Do not speak with any po licemen, even if you witness an incident. If you want to report an incident go to a po lice station. If you want to report a po liceman in San Francisco there is paper work you can fill out and submit. Tagged with 2013, california, government, Local, Mission district, Neighborhood, police, politics, protest, public, san francisco, thinking, U.S.
Police raided the OCCUPY Oakland site early this morning and closed BART. BART is OUR public transportation and Oakland is OUR city! OCCUPY Oakland Champion Dan Siegel, one of the mayor Quan’s top legal advisers, resigned over the decision to raid the anti-Wall Street protest encampment on Nov.14th, 2011, a civil rights attorney and friend of Quan, he worked as an unpaid adviser. He has been a outspoken critic of Oakland police and also had opposed the Oct. 25th, 2011 raid. What are the rules for closure of BART Dan? Oppose the raids and the closure of BART! The government media can focus on cleanliness and the rules made by the police for the protesters at Frank Ogawa Plaza, but as many of us know and saw from the Oct.25th, OCCUPY Oakland raid and from the raids happening across the country, the police rules are in their favor and the force they use has dire consequences. The focus on silly issues keeps the citizens of the U.S. from thinking about the violence perpetrated on the OCCUPIERS in and around the U.S. This is OUR U.S. government, not Egypt’s, not Iran’s, places we have been taught wrongly that refuse their citizens their rights. This is the U.S. that is refusing us our civil right to FREE SPEECH and PROTEST. This is OUR government refusing us OUR CIVIL RIGHTS, not some place most U.S. citizens have never been, not some other country we’ve been lied to about. This IS OUR ‘land of the free and home of the brave’, GO OCCUPIERS! Tagged with BART, BART closure, civil rights, civil rights attorney, closure, Dan Siegel, Egypt, free speech, friends, government, Iran, Local, mayor, Mayor Quan, Neighborhood, OCCUPIERS, OCCUPY Oakland, police, political, politics, protest, public, silly issues, U.S. I wrote a letter to Rabbi Lerner, someone I admire and listen, to form my own thoughts and opinions. I am not Jewish or religious, but feel inspired by many intelligent people, he being just one of the many. Rabbi Lerner posted an email from a student about the U.S. OCCUPY movement in Oakland and its youth. It bothered me, you can read it and his response to his student here at http://www.tikkun.org and read more and different here at http:// http://www.spiritualprogressives.org. Here is my email and his response. Yes, Sarah, for these thoughts! I also don’t know why I am writing, but Jordan’s letter disturbs me. Your letter made me rejoice. Forgive he says and yet? He was right to speak out against racism and forgive. I am left wondering how he or anyone thinks these youth, remember what ‘youth’ itself means, of color and not, may have heard of the “legacy before them?” They are creating the legacy, they are the brave. This group that protests for us all, is all colors of youth, elderly, mentally ill, drug addicted, veterans with and without PTSD, the unemployed, the educated, the disabled and the able, the uneducated, the anarchists and let us be clear ‘not all anarchists are violent’, parents, ministers and the truant. This protest is not about the individual, it is about the group and though the language of youth and anger may be harsh it must be expressed. Words do not kill. Words let us communicate. Your student educated and that is good. It is also good this person of youth could say his words so he could be educated. Let us not learn to hold our tongue, but express our feelings and thoughts in a manner that sends a message clearly. The Oakland police acted brutally, Oct. 25th in Oakland,California against peaceful protesters. As it turns out Mayor Quan knew this action was ‘going‘ to happen, but did not know ‘when’ Oakland police would act. He, the police chief acted when she, Mayor Quan was in D.C. Isn’t Mayor Quan the police chiefs boss? Was she unable to fire the Oakland police chief, because she knew the plan and was part of the discussion? Does Mayor Quan support the right to free speech and the people or will she fall into line? Keep an eye on Oakland, Mayor Quan is Oakland’s ‘new mayor’. She walked the streets and got support from the Oakland community. She was not the favored candidate, the people voted her into office. At least three of San Francisco’s city supervisors and mayoral candidates, John Avalos. Leeland Yee and David Chui spent Wednesday night with the OCCUPY SF movement. I heard they stayed to support the movement and to dissuade Ed Lee, San Francisco’s interim Mayor from breaking up the Occupied area of San Francisco. Police were seen fully dressed in riot gear and protesters were peacefully awaiting their arrival. The police never arrived at OCCUPY San Francisco, at least not Wednesday night. I recently visited Bisbee and Tucson, AZ. These places were OCCUPIED! In every visit I made there were smiling young women and men, some were students and some were travelers. They were spreading peace and information. They had set up a community of tents and were sharing meals with one another, strangers to themselves. They were not asking for donations, though I gave one. Oakland and Fremont and police from 16 other places in the Bay area, behaved violently in hope that the protesters would behave violently. The U.S. wants its citizens to think we are different from the Arabs and Arab Spring, to think we are different from the Iranians. We are not different! We are oppressed! How much money was spent on just the police from 17 different places? How much money was spent on weapons to oppress it’s peaceful protesters in Oakland. Why is there money for Violence and War and not for our children’s food, education, healthcare? I just heard or read that Obama was in Denver, Colorado promising 1/2 percent less on student loans. Half a percent? That is so little and not nearly enough! I worry that Americans will take that tiny amount and be satisfied. I worry that the people will be tricked into thinking the Democrats are better than the Republicans and will settle for 1/2 percent off of their student loans. I am sickened with the thought that Americans are simple minded. OCCUPY and the OCCUPIERS are the Real Americans, the Real patriots! When was the last time the banks gave you back your bounced check fee? When was the last time our kids ate healthy school lunches? When was the last time you could explain to the Police that you could not afford that parking ticket and they tore it up? When was the last time you got free books for college or for your child in elementary school? When was the last time the police drove your son home, instead of hauling him off to jail? When did they start taking money, small amounts, multiple times, from our senior citizens? Where are our pensions? Don’t be tricked into oppressing your fellow man, let him off when you can! OCCUPY!!!!!! 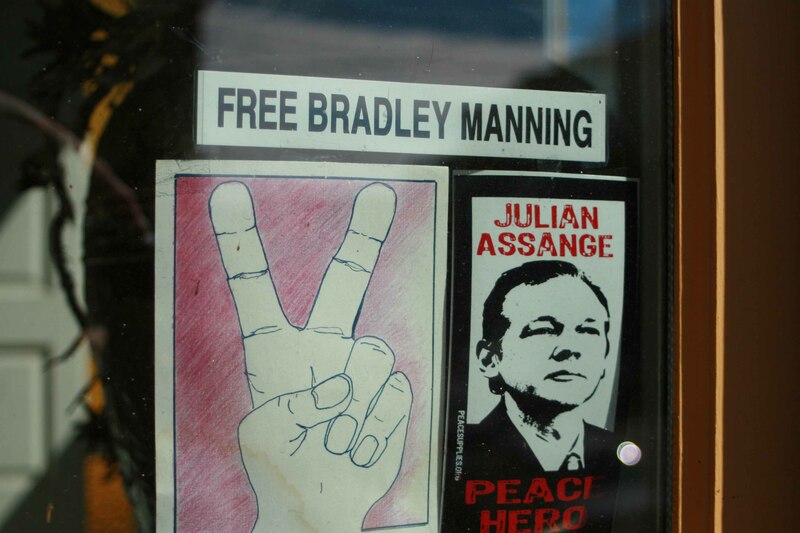 I just read that Bradley Manning and Julian Assange have been nominated for the Nobel Peace Prize. I also read this will not help them with their legal issues, ‘necessarily’. How can that be? Why does the truth not set them free? I read the idea of selling our post offices is being bounced around in our government. How can they sell OUR post offices, what large corporation will deliver OUR votes if we don’t have a post office? How will people get mail that live in places without anything but a post office? And then I read about the peaceful march happening in New York and saw images of police brutality. I thought while watching and reading, “that if I lived in NY, I would be at those marches, if it were only closer, I thought.” Sometime later I heard that there would be a march in San Francisco, ‘close to me’ and then I thought, “I’m too afraid to go, I’m a non-violent, I’m…..” and then I burst into tears. All of those thoughts are truths. I am afraid, I am non-violent, and I do live close. I will be going to the march, though I am afraid, non-violent and a cry baby. I am over-riding my natural impulse to stay away from danger and protest from afar. The ability to over-ride my-Self, is what I believe makes us different from other mammals. I encourage all of us to peacefully protest the inequities in our current society, over-ride yourself if need be. We are powerful together, without violence.